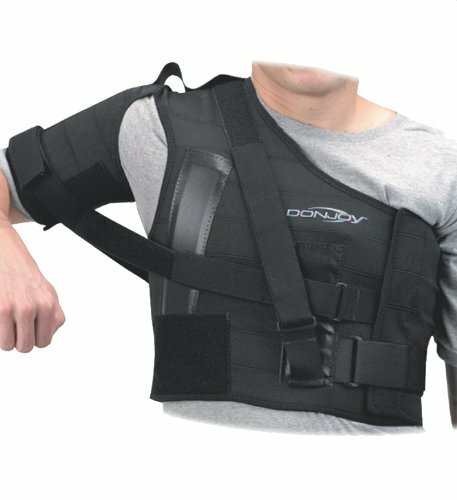 The DonJoy Shoulder Stabilizer provides shoulder immobilization and controlled range of motion for glenohumeral dislocations/subluxations, rotator cuff tears and acromioclavicular separations. This shoulder stabilizer is designed to protect and stabilize the shoulder post-injury and post-operatively. The DonJoy Shoulder Stabilizer assists you in your return to activity by controlling shoulder motion, thereby reducing the risk of injury. This stabilizer provides abduction control, external rotation control, and support for acromioclavicular separations. The range of motion control can be customized with easy strap adjustments. Made from latex-free black polyester lycra material.